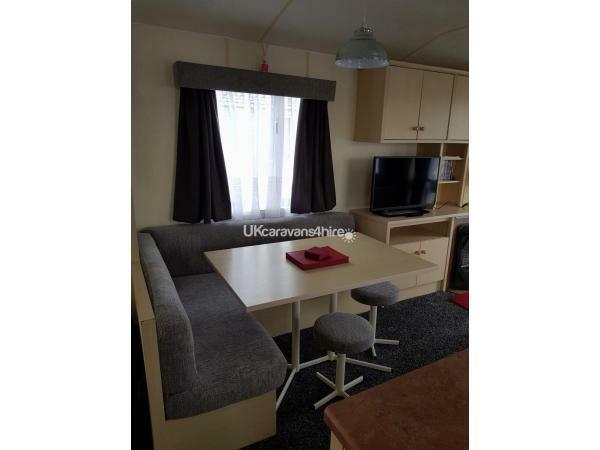 Additional Info: This static caravan has been refurbished for season 2019, all bedding and fresh linen is provided in the caravan for your arrival, tea towels, dish cloths, scoures and washing up liquid surplied, for outside sun parsol, padded seat cushions and a bbq for your use. 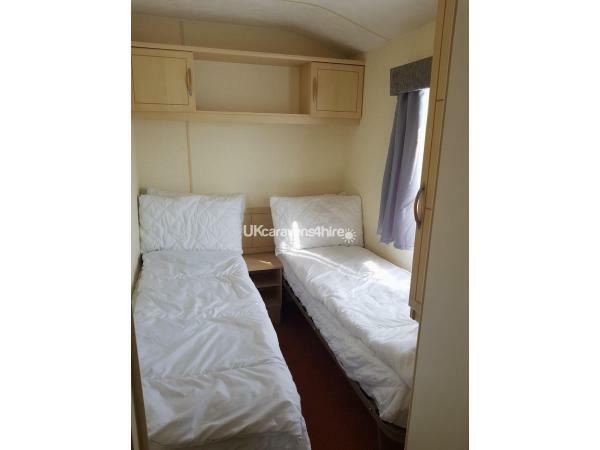 Ruby 40 is a 3 bedroom caravan. It is fully equipped for your stay, there is one double room, two twin rooms, and two bathrooms, plus a 32" TV /DVD with freeview, microwave, toaster, kettle, hairdryer, iron and board plus all the usual crockery, plus tea towels and dish clothes and most important glasses for you to fill with your favourite tipple. For your safety there are 2 smoke alarms, a carbon monoxide alarm, fire extinguisher, fire blanket plus first aid kit. There's a patio table and chairs outside on the pathed area plus a bbq for your use, you can sit and relax and enjoy watching the world go by in a pretty setting adjacent to a lawn area also for your use. Complimentary starter pack of tea bags, coffee, sugar, sweeteners, salt and pepper on arrival. A small selection of books, jigsaws, games and dvds are available for you to use while staying in the van however can we ask you look after them for others to be able to use. Please bring your own towels however we do provide bed linen sets which will be in the van on your arrival for you to make up the beds, if you would like the beds made up for you there will be a small charge of £10.00. 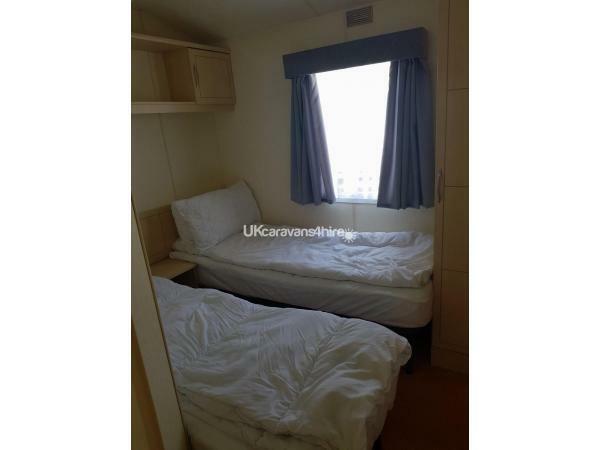 Our caravan is available from 3pm on day of arrival and should be vacated by 11 am on day of departure. Lots of dates available at the moment but these are booking up fast so reserve and secure your dates now with just a £50 deposit/bond which is refundable after you vacate the van and it has been checked for any *cleaning or breakages plus has not been cancelled after deposit paid this is payable by bank transfer then four weeks before your break payment is required in full or the holiday will be released. 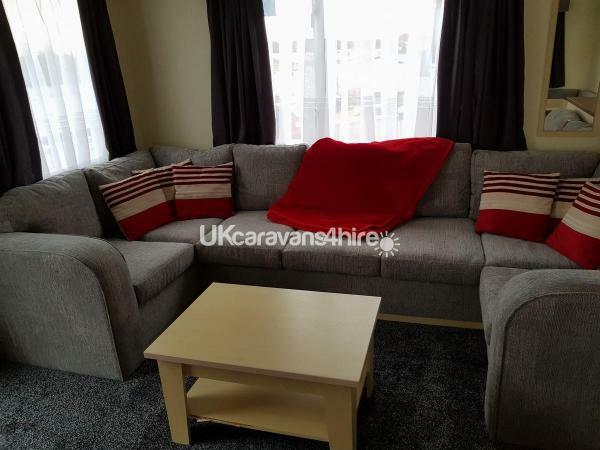 * If it takes more than an hour to get the van ready for next guests, rubbish not removed or beds not stripped of bed linen/ bed linen not used on beds then bedding needs cleaning. Passes will be required for some amenities on the park and can be purchased at reception on arrival. Additional Info: Pub/club, indoor bowling green, fishing, amusement arcade, indoor pool which had been modernised for 2019, sauna, Jacuzzi and steam room, laundrette, convenience store, takeaway chippie, sir drakes café, kids club and a brand new play ground for 2019.